INdian PM Node and US President Obama shake hands on the nuclear deal. 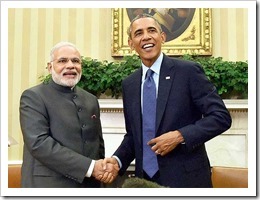 US President Obama and and Indian Prime Minister Modi were able to declare victory over a long standing dispute between the two countries regarding a strict and unreasonable nuclear liability law. Don’t expect US nuclear firms to break ground soon for any of the planned projects that have been listed for years in India’s commercial nuclear energy program. There is no signed piece of paper, joint communique with terms & conditions in it, or treaty between the US and India that says US nuclear firms, including Westinghouse and GE Hitachi, will now be exempt from the provisions of a nuclear liability law enacted with the support of the BJP, the political party that swept PM Nodi into office. There are plenty of press statements, but you can’t bet a multi-billion dollar nuclear reactor on public relations. A fig leaf of an insurance pool, with $200 million assigned to it, is supposed to cover the costs of liability should any of the components of a reactor supplied by a US firm fail even years after being installed and operated by NPCIL. According to information provided by Indian government officials, the idea is that US firms would buy additional insurance, and then charge the cost of it back to NPCIL as part of the overall cost of delivering the reactor. In effect, NPCIL would self-insure. Considering the potential cost of a nuclear accident, pricing the insurance will be interesting. No one on the US side is buying it. Spokesmen for both Westinghouse and GE Hitachi were noncommittal in response to questions from the news media about the so-called “breakthrough” deal and the insurance pool. At best their responses have been lukewarm. Both firms worry that the timeline for starting construction of planned power stations will be pushed back even further while legal experts try to figure out what’s really changed as a result of the announcement by the two world leaders. The first phase, for 22 GWe, has a number of detailed plans in place for new nuclear power stations. Of the 22 GWe, about 5.4 GWe could potentially be built by Westinghouse (2 1150 MW AP1000s) and by GE Hitachi (2 1600 MW ESBWR). Total market share works out to about 25% of the new build. In the second phase, which includes plans for a whopping 40 Gwe, the plans for reactors are less firm and some sites are still up in the air. That said, of the the total size of the new build in that phase, US firms see a decline in their market share to just 19% of total power requirements. French and Russian state-owned firms are also part of both phases. What hasn’t been addressed in some of the aggressive targets for new reactor construction, regardless of vendor, is how India will strengthen its nuclear safety and regulatory oversight capabilities for both construction and operation of all these reactors. The nation’s installed base is about 5 Gwe. A 12 fold increase to over 60 GWe will call for a significant effort to insure the reactors are built according to their design and operated safely. At least four designs will be involved: 1 each from France and Russia, and two from the U.S.
Like other nations planning massive investment in nuclear energy, India will have to ramp up its nuclear safety organizations to meet the challenge or experience delays in meeting the self-imposed deadlines of its ambitious program. Areva has plans to build six 1650 MW EPRs at Jaitapur, which is a site on India’s west coast. Only two are short-listed for construction. Areva is still struggling to determine how it would be affected by the liability law. Also, there have been local protests about the project related to the government taking farmland for the power station site and the cost of electricity from the plant once it is built. Russia recently completed and commissioned two 1000 MW VVERs at Kudankulam, a coastal site on the very most southern tip of the country. While Russian PM Putin said in a recent trip to India that Rosatom would build between 12 more reactors, as a practical matter, the only near-term plans NPCIL has on its books are to build two more VVERs at Kudankulam. Both units are expected to be completed in the next four-to-five years. Indian firms like L&T would benefit from these deals for several reasons. First, large forgings for these and future reactors would require new heavy industry factories with thousands of new, high paying jobs. Second, firms like L&T would also be in line to provide equipment such as steam generators, turbines, and electrical switch station equipment. The new power stations would set off a huge construction program of transmission lines to bring the power to customers. All of them would be built by Indian firms. L&T and other Indian heavy industry firms have agreements to build these factories, in collaboration with Westinghouse and GE Hitachi. These plans remain unrealized due to continued uncertainty over the liability law. L&T did build a factory at Hazira in Gujatat which was intended to supply reactor components for Westinghouse Ap1000s. It is being used to serve other customers in non-nuclear industries. L&T’s CEO and the executives of other Indian heavy industry firms have repeatedly complained that they too are subject to the liability law. Recently, L&T refused to submit a bid on a PHWR reactor project for this reason. The project in question is the 1400 MW reactor at Gorakhpur, Haryana. L&T’s said the “right of recourse” clause affects both domestic and foreign suppliers/vendors and contractors. L&T also complained about differing interpretations of the liability law by NPCIL and the Department of Atomic Energy. PM Nodi has not been able to get Japan to sign off on a deal to provide nuclear technology including large forgings from Japan Steel Works. Japanese government officials, including PM Abe, worry about India diverting uranium from its deal with Australia to military uses. India is not a party to the nuclear nonproliferation treaty which is also an issue for the US. It is unclear how the US will track uranium shipments in terms of end use once they arrive in India. A provision for information exchanges between the two countries is reported to reply on IAEA monitoring, but that activity doesn’t cover all of India’s nuclear facilities. It is likely a republican led US Congress will eventually look at compliance with the Hyde Act of 2000 that addresses measures to prevent diversion of uranium for military purposes. When will India increase the supply of electrical power to its people? Even if everything works, will the Indian people benefit? It should be noted that stealing electrical power from the grid is a contact sport in India. Widespread abuse makes efficient billing and cost recovery, much less profits, a hidden issue. NPCIL owns and operates the plants and the grids. So, in the end the government is still the key supplier of power to the people whether they pay for it or not. India get most of its power from coal plants. The nation has consistently told western powers it will not curb the operation of the coal-fired power stations it has in terms of CO2 emissions while most of its population lives in poverty. PM Nodi has committed to a significant new build of solar and wind projects, but getting them off the ground still has to face the nation’s bloated bureaucracy and corrupt local politics. In July 2012 the nation’s inadequate power infrastructure collapsed sending 650 million people into darkness for two days. It remains unclear whether the promise of new nuclear power stations will become a reality, at least as long as uncertainty hangs over new projects caused by the liability law that is still on the books.